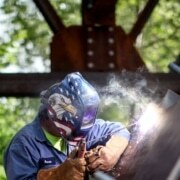 U.S. Bridge has decades of experience in manufacturing, engineering, and installing steel bridges. Our company proudly serves communities in the United States and around the world with thousands of bridge projects in more than 50 countries. And as a global operations company, U.S. Bridge is dedicated to providing a service that aims to help communities in need of a steel bridge. Shortly after Hurricane Maria wreaked havoc in Puerto Rico, U.S. Bridge knew what it needed to do to help restore communities in the island. So, the team set out to visit affected areas and prepared a plan to provide 5 Liberty Series bridges for 5 different communities. 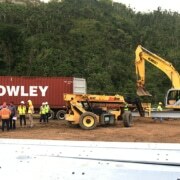 U.S. Bridge brought relief to Puerto Rico with the Liberty bridges. 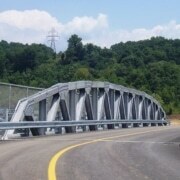 And in just six weeks, the bridges were manufactured and installation was completed. 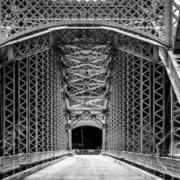 It took over 850 metric tons of U.S. steel to create more than 950 feet of bridge. Today, all those communities in Puerto Rico have permanent Liberty Bridges. Mafia Island is located in the Indian Ocean just 20 miles from mainland Tanzania. This idyllic island is part of the Tanzanian Zanzibar Archipelago and offers gorgeous islets, unparalleled diving, snorkeling, historical sites, and an untainted culture. U.S. Bridge provided a Cambridge Flat for Mafia Island in Tanzania when the daily low and high tide cycle began to affect the offloading of goods coming to the island. Thus, as part of the global operations initiative, U.S. Bridge recommended a galvanized Cambridge Flat. The Cambridge Flat style bridge serves as a jetty to allow the offloading of freight and passengers to Mafia Island. The bridge totals 27 spans, stretching 1km (3,286’) long and 4.3m (14’) wide. And it consists of 24 spans that are 40m (141’) with a width of almost 4.3m (14’), two wider transfer spans, and a platform at the end measuring 15m (49’) x 24m (79’). 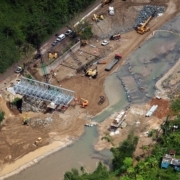 U.S. Bridge provided a bridge replacement in a remote area in Peru. With a dual requirement of being quickly deployable and adjustable to different lengths, the Liberty Series was the perfect solution. The Liberty Series Modular Panel Bridge was 55 m long x 3.66 m wide and met all the requirements needed. 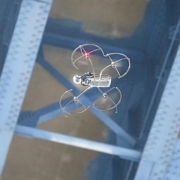 Also, one of the benefits of the Liberty Series bridge is that its panel system was designed to adjust to different lengths by simply adding or removing existing panels. The U.S. Bridge global operations seeks to serve communities with a quick turnaround without jeopardizing the quality of the bridge. 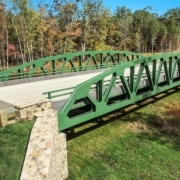 Our bridge options ensure durability, and longevity, allowing communities to remain connected. 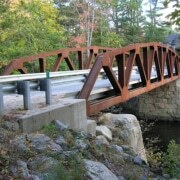 Contact us and get a quote today to find out more about U.S. Bridge.